C. Buci-Glucksmann, De La Post-Abstraction Americaine, pg. 76, Art Absolument, 2014. P. Karmel & J. Pissaro, Conceptual Abstraction, pg. 24, Hunter College Times Square Gallery, New York, 2012. H. Cotter, 'Conceptual Abstraction' Hunter College/ Times Square Gallery, New York Times, Art in Review. Museum Haus Konstruktiv Complete Concrete, pg. 102, Published by Hatje Cantz, Germany, 2011. R. Rubinstein, Lydia Dona: Zones of Luminous Conflict, in Exhibition Catalogue: The Engulfments of Change, Galeria Joan Prats, Barcelona, Spain 2006. H. Loreck, Techno-urbane Korper: Lydia Donas Malerei, in: Frame, pages 80-84, July/August 2000. R. Barahona-Sotela, The hermeneutics of the Human Existence, in: Artmedia, January 2007. El Artista Y su Estudio (Lydia Dona in her studio), pages 30-34. R. Rubenstein, Critical Mess: Art Critics on the State of their Practice. Hartford Press Editions, Massachusetts, 2006. R. Rubenstein. Polychrome Profusion: Selected Art Criticism: 1990-2002. Hard Press Editions, Massachusetts, 2003. D.Ryan, Talking Painting; Dialogues with Twelve Contemporary Abstract Painters. Taylor and Francis Books, London, U.S.A, Canada 2002. J. Yau, Lydia Dona From Heat To Sub-Zero, pg 53, in: The Brooklyn Rail, April 2008. P. Bui, In Conversation: Lydia Dona with Phong Bui, pages 34-36, in: The Brooklyn Rail, April 2008. M. Cheetham, Abstract Art Against Autonomy: Infection, Resistance, and Cure Since the 60s, Cambridge University Press, New York, 2006. E. Wimmer, Lydia Dona in Exhibition Catalogue pages 24-25: Abstraction Revisited, Chelsea Art Museum, New York 2010. D. Moos, Lydia Dona: Architecture of Anxiety, Abstraction issue, in: Journal of Philosophy and the Visual Arts, No.5, pages 43-51, Academy Editions, 1995. A. Harris, Post Void, in: Survey. Lydia Dona. 1989-1995, Exhibition Catalogue pages 5-9, University of Buffalo Art Gallery/ Research Center in Art + Culture, Buffalo/ Art Gallery of Hamilton, Hamilton, Ontario Canada/ Macdonald Stewart Art Centre, Guelph, Ontario Canada 1995-97, Buffalo 1996. 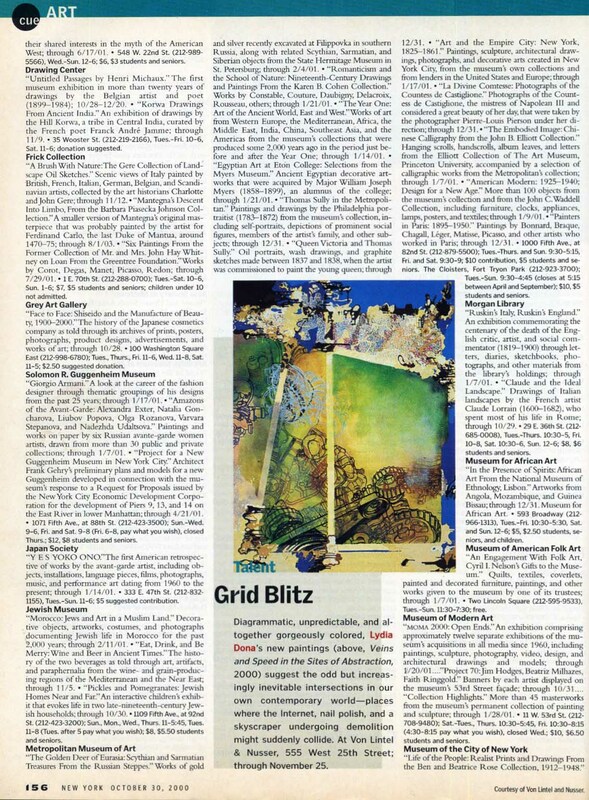 E. Newhall, Lydia Dona in Grid Blitz, pg. 156, in: New York Magazine, October 30, 2000. 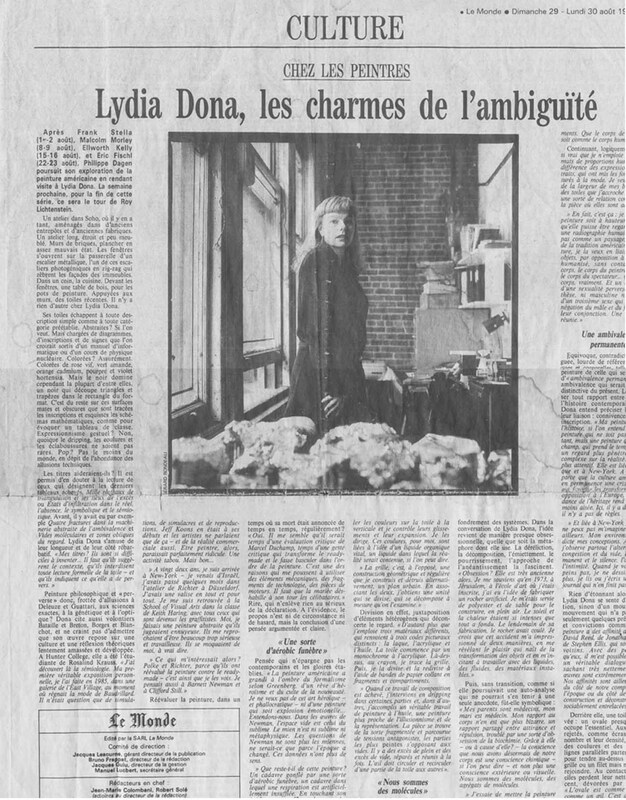 P. Dagen, Lydia Dona, Les Charmes de L'Ambiguite, Interview, in: Le Monde, August 30,1993.